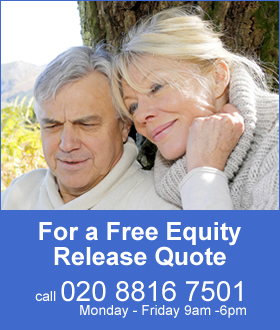 Standard annuity rate providers have reduced rates following the quarter percent rise in interest rates to 0.5% although the Bank of England has indicated future increases would be at a gradual pace and to a limited extent. 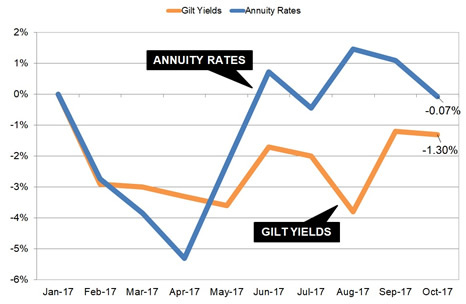 Annuity rates have been kept above gilt yields since May 2017 by providers in anticipation of further interest rate rises. This is the first rise of interest rates since July 2007 from an all time low of 0.25% to their current level of 0.5%. 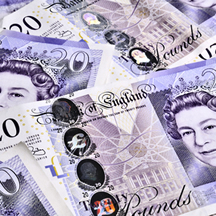 The Bank of England has indicated future rises will be at a gradual pace and to a limited extent. Annuities are primarily based on the 15-year gilt yields which are influenced in part by interest rates so with no expectation of further increases standard rates are moving lower. The pound has also seen the worst fall on foreign exchange markets since the Brexit vote reacting to the Bank of England's expectation of further interest rate rises with another rise not likely until August 2018. The 15-year gilt yields have remained down during 2017 and are -1.30% lower than the January levels. In contrast annuity rates have remained high during the summer and are now decreasing to converge with gilt yields. The above table shows standard annuity rates for our benchmark example of a 65 year old buying a single life, level annuity with a fund of £100,000. Rates are now -0.07% below the January level with gilt yields slightly lower at -1.30%. Smoker and enhanced annuity rates have increased slightly over the past month rising 0.39% although providers have not been as aggressive during the year as with the standard rates. Although another interest rate rise in the UK looks unlikely in the short term there are other actions that could seen a fall in the price of gilts and bonds, a rise in yields and also annuity rates. The European Central Bank (ECB) has suggested the €1.1 trillion quantitative easing (QE) programme would be tapered and with a schedule announced later this year to initiate sometime in 2018 onwards. This shift away from monetary policy would result in investors selling gilts and bonds sending the price down and yields higher. In addition the Federal Reserve has announced it will begin the unwinding of its $4.5 trillion portfolio following the financial crisis and their bond buying QE programme. This would have a longer term impact on raising yields on gilts and bonds. New tax reforms in the US would dramatically reduce corporation tax from the current level of 35% to only 20%. If the reduction in tax does not stimulate growth in the economy there would be a shortfall tax receipts and fiscal deficits. The government would need to issue debt to compensate and investors are concerned this will reduce bond prices and increase yields.